"Apricot jam lends a fruitiness to the honey mustard marinade. Serve over rice, if desired." Delicious! 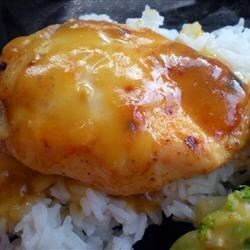 I used 4 chicken breasts instead and didn't marinade as long and it still worked perfectly. Lower cooking time to 30 minutes if using just the breasts. We all loved it. Very flavorful and easy to prepare. If just cooking breasts, reduce cook time to about 30 minutes. My husband and I really liked this recipe. I thought that the next time that I made it, I would add some chopped cashews to add a little crunch. It was really tasty though and very filling.